Baked pumpkin donut holes coated with cinnamon and sugar. These make the perfect breakfast for fall! I’ve been super excited to share this recipe with you all for a while now. I’ve mentioned my baked pumpkin donuts quite a few times lately, to say that I’m obsessed with them would probably be an understatement. They are soft, light, full of pumpkin flavor, and just seriously good. I decided to double the recipe with a few small changes to make some donut holes. I added a bit more pumpkin to the batter, because well, I love pumpkin. I also decreased the sugar just a bit, since we’re coating these with cinnamon and sugar they will be plenty sweet enough. The donut holes are actually baked in a mini muffin pan and incredibly easy to make. I only fill mine about 3/4 of the way full and I usually end up with about 32-34 donut holes. If you just have one mini muffin pan, you’ll have to bake these in two separate batches. But, they only take about 12 minutes to bake, so they still come together pretty quickly. After they come out of the oven, you’ll let them cool a bit while you melt some butter and mix up the cinnamon and sugar. You’ll give them a quick dunk in the butter, I always make sure they’re completely coated in the butter so that the cinnamon and sugar will stick better. Then comes the best part, the cinnamon and sugar coating! You’ll toss them around in that and you’re done. These are best eaten the same day that you prepare them. You can bake the actual donut holes a little ahead of time and then coat them in the cinnamon and sugar just before serving. Just looking at these pictures makes me think a second breakfast of pumpkin donut holes is in order. Spoon the batter into the mini muffin cavities about 3/4 of the way full. Bake at 350 degrees for 11-13 minutes or until a wooden toothpick inserted into the donut hole comes out clean. 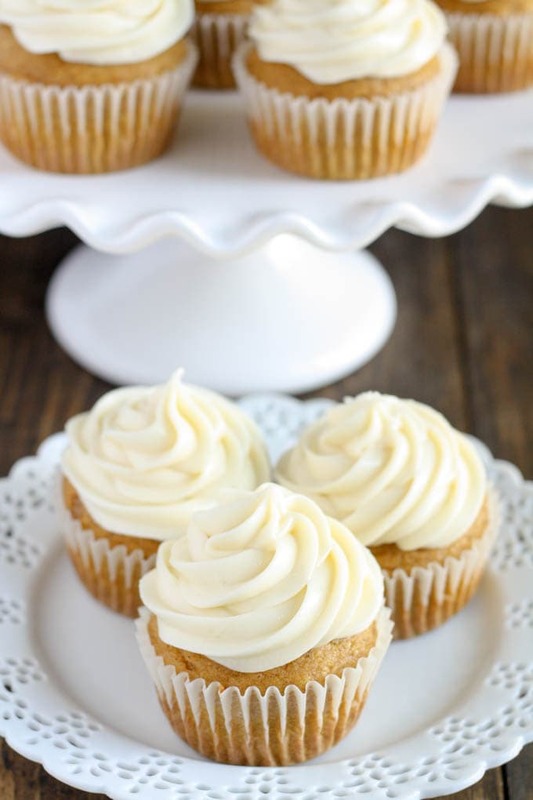 If you love pumpkin as much as I do, try my Pumpkin Cupcakes with Cream Cheese Frosting next! Made this tonight to take to my nursing co-workers tomorrow morning. Of course I had to take 1 (or 2) and I don’t foresee having any to bring home. Such an easy and tastey recipe. Will definitely make again!! Can I use pastry flour instead of all purpose? I made these pumpkin balls over the weekend. They are awesome. Thanks for sharing. Thank you, Jodie! I’m glad you liked them! How do you get them round if you’re baking them in a mini muffin pan? Don’t they come out like cupcakes? They’re not round, they look like mini muffins (minus the muffin top). Once you coat them in the cinnamon and sugar it’s less obvious that they’re muffins. I’m gluten and dairy free. Can you make these with gluten free flour and non dairy milk? Non-dairy milk would be fine, but I haven’t used gluten-free flour much when it comes to baking. If you have a gluten-free flour that substitutes well 1:1 for all-purpose flour, then that should be fine. I username my cake pop maker. These are amazing! Thanks for the recipe! Glad you liked the donut holes, Liz! I made them in a cake pop pan and they came out perfectly! Delicious, too yummy! So glad you liked the donut holes, Amy!